CET’s truck driver course is one of the best in the industry. In this accelerated version, you’ll train to become a truck driver in 10 weeks. Being the best, CET teaches the skills and knowledge to pass the test. Plus you get hands-on practice hours behind the wheel. You’ll learn maintenance and safety checks and how to handle different driving conditions. You will be prepared to take the commercial driver’s license test. Once you graduate and pass, we’ll help you find a job as a professional truck driver. Prep for state licensing exams for Pre-trip, Air Brakes, Driving and more. Say yes to CET Truck Driver I! New career in 10 weeks? * yes! Grants for those who qualify? yes! Where do the Truck Driver I job training classes take place? 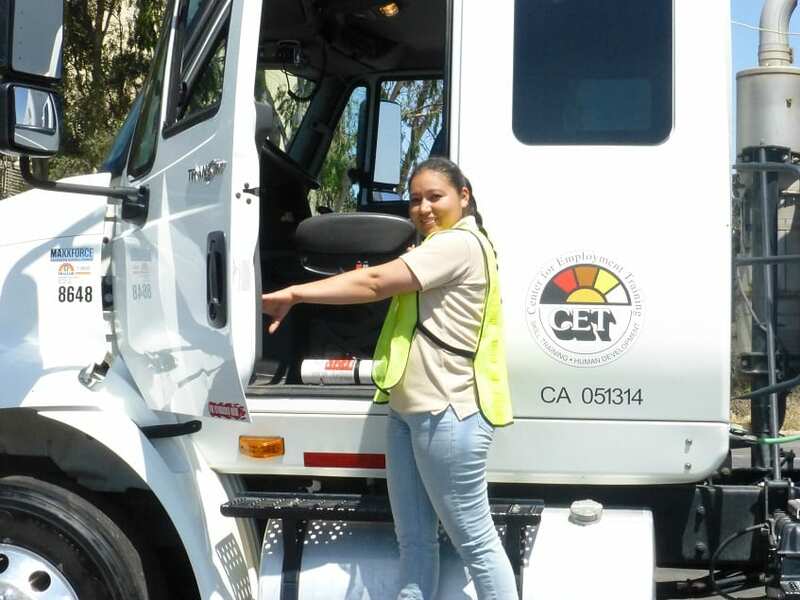 CET offers this short term truck driver program in Soledad, CA. Classes are now forming in El Centro, CA and Coming Soon to Santa Maria, CA. How long does it take to finish this short term course? Students can finish the 300 hour program in about 10 weeks. This is an evening class only. You’ll meet Monday through Friday for 10 weeks. Class start times vary so be sure to check the location page. Check out tuition costs in the program description. This affordable program can be financed a few different ways, but is not eligible for federal aid (Title IV – Pell Grants and Student Loans). You’ll want to meet with a financial aid advisor anyway to discuss other options which may be available to you. CET’s short term Truck Driver I job training program focuses on the skills you need for the job. Check out the program description for what you’re going to learn and what you'll need to be prepared. We integrate basic skills (math and language) into the program if you need support. If you didn’t graduate from high school, ask an admissions advisor if there is an “Adult Education Career Pathways” program available to help you earn your GED. Students in this commercial truck driving program will be prepared to take the commercial driver’s license test. Ask if you qualify for grants which may cover testing fees. What types of jobs can I find after I graduate from the truck driving program and what can I expect to make? When you've completed this accelerated program, you are qualified for over the road driving. You can learn more by visiting this link: Heavy Tractor-Trailer Truck Driver*. When does the next class start and how to I apply? Applying to CET is easy. CET has open enrollment, so once your enrollment is completed, you can start right away. Visit the Admissions page, or better Sign up for a Tour and talk to an advisor in person. *Job outlook data are listed to provide additional information on related jobs, specialties, and/or industry. Links to non-CET sites are provided for your convenience and do not constitute an endorsement. Learn about mynextmove.org.